Donna, I and a recovering Tucker visited the beautiful Panther Creek Falls. 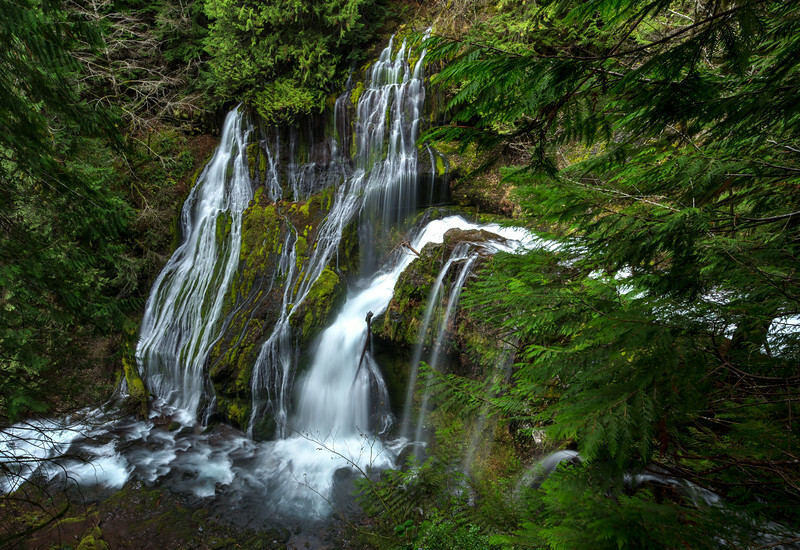 This is one of the most impressive waterfalls in the entire Gorge region. 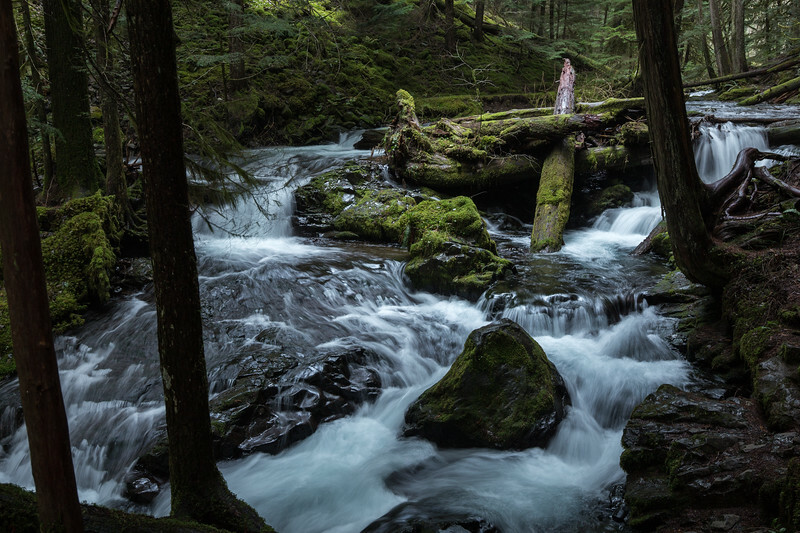 It's a hidden gem inside the Gifford Pinchot National Forest that few people know about. We were the only ones there for a short period. 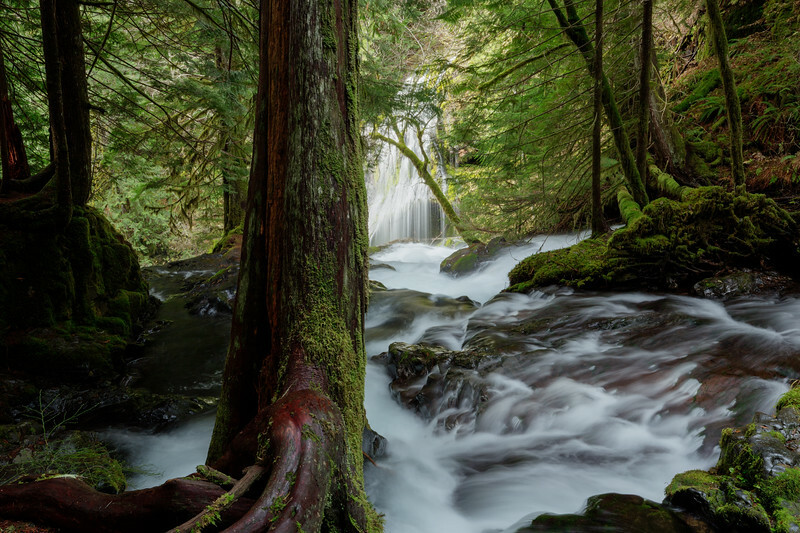 It's a short walk to a wooden viewing platform perfectly perched for one to marvel at such a unique waterfall. From there you'll get a stunning view of two steams merging together to form a beautiful wall of cascading water. The falls on the right that flow from the clearly visible upper stream are about 69 feet, and the other falls that feed from the cliff on the left are about 102 feet. In total, the falls drop about 136 feet, which includes a few smaller steps. The remaining 90 percent of the stream makes a hard right turn and follows a natural trough along the top of the cliff, contouring around the top of the horseshoe-shaped basin until reaching the far side, then plunging in a twisting fall for 69 feet to the bottom of the first step. Immediately adjacent to the main stream a large spring sends a broad veil of water sheeting 102 feet down the side of the canyon. After the collective waters of these streams merge, they plunge over the second tier in three distinct channels, falling 30 feet into a pool, with a broad 4-foot ledge immediately below to culminate the formation. Without visual aids to illustrate the scene it's quite complicated to imagine and grasp the complexity and eclecticism. There is no developed route to the base of the falls and the "path" which leads there is quite sketchy, involving scaling down a nearly vertical cliff of about 15-feet in height. I must be getting old because I tried to get to the base of the falls, and got about halfway down and quit because the rocks were wet. I will return with some rope and get to the base on another trip to capture the complete magnificence of this waterfall.